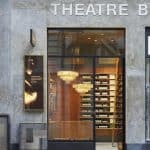 Aesop is definitely the discovery of this year for LuxuryActivist. A while ago we reviewed the relaunch of Marrakech, the iconic fragrance of the Australian brand. 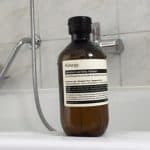 This month we tried 3 products from Aesop and the results are pretty amazing. Aesop Moroccan Neroli Shaving Serum, amazing. We all known Shaving foam, Shaving oil, Shaving soap but I must say that a Shaving serum is definitely more original. Aesop has an amazing shaving product that will modestly blow your mind. If you have normal skin and bear or if you have a more sensitive case, this product is for you. This serum will protect your skin and allow a better sliding. You will be able to reach the hair beard closest to the skin. You will have a perfect result. The formula is quite short, as all Aesop products. The aim is to have an efficient yet qualitative product for one of the biggest men’s problem: shaving. 3 main ingredients are highlighted: Sandalwood, Neroli blossom and Panthenol. This trio allows a perfect combination to prepare your skin and your hair beard to shaving. Another ingredient is present in the formula in a significant way, it is Aloe Vera. The formula contains also Clove, which is a strong anti-septics. A simple formula for a great result. You can use it with a shaving badger for a more precise result or directly with your hands. At the beginning you will be surprised by the lack of foam, almost like if it would not work. Only when you start shaving that you understand the power of this product. Shaving operates effortless and the result is perfect for a couple of days. The skin is protected so no red cheeks anymore. The scent of this product is a complete olfactory journey. Once you have shaved, the following product will be the perfect match to complete the shaving ritual. Moroccan Neroli Post-Shave Lotion, instant result. After shaving, your skin requires good care. An after-shave product is almost mandatory otherwise your skin will be hurt every time until you get an ugly skin. Every man, at least once in their live tried not to use an after-shave lotion or balm. The feeling in your skin is completely uncomfortable. The skin stretches, is sensitive (do not get a kiss just after) and can causes redness. So yes, you do need a post-shave product. But which one should you choose? Aesop developed the perfect Post-Shave product. The Moroccan Neroli Post-Shave lotion will take good care of your skin and give your that baby skin you always dream to have. It’s formulation is simple, qualitative and efficient. In addition to the Moroccan Neroli, you can also find Wild Rose fruit oil, Hamamelis, Shea Butter, Olive oil, Sandalwood oil, Clove flowers, Ginger root and Panthenol. This blend will soothe your skin, bring an important antiseptics action and prevent after-shave burn. And the last touch of morning hygiene, not only for men but also for women will be the deodorant. Probably the last gesture of pure hygiene you will do in the morning is the deodorant. No matter how odorless you are, if you do not wear an appropriate deodorant, you will smell sweating after a couple of hours. Unless if you are a child under 3 years old of course. But any adult will have to wear a deodorant, of course you can take the option to have a bad smell. Then you are on your own this case. After trying all deodorants possible you can imagine, you might be positively surprised by the one from Aesop. First of all, the packaging does not looks like a current deodorant. When I got it at the first time I thought I got it wrong. And actually it is a cool packaging. It was the first time I found a deodorant packaging cool. Most of the time we do not really care. I liked the simplicity of it. As it is something you will use everyday, it means you might use several of them every year. Having a proper and simple recycling property is something that can be important for your choice. Some deodorants have several materials blended, like plastic and glass. How can you recycle it without making a mess in your bathroom. Here, with Aesop, the packaging, as all Aesop products are easily recycled. Then you will also see the generous and delicate spray that will serve the deodorant in your skin very homogeneous and without any effort. It is a natural spray, so not propulsion gas involved. Final but not least, the formula, which is basically the most important! To start, it is a completely Aluminium-free deodorant with some key elements such as Vetiver roots, Coriander seeds and Zinc Ricinoleate (extracted from the Ricin bush). You can also find Hamamelis, Lavender oil, Sandalwood oil, Tea leaf oil and Thyme oil. I was surprised to see Alcohol as well as while using, I could not feel it. Most of the time, people tend to not choose a deodorant with alcohol inside, which is my case, well in this case I need to review my opinion. The formula was really gentle and efficient for more than 24 hours. The scent is very original as it does not looks like you are wearing a deodorant. It is more like a fragrance in the sense original and sophisticated. You have the natural scent of the ingredients used, so no “Fragrance” in the ingredients list. So now you know more about this amazing brand. 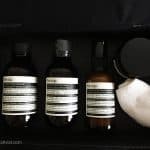 Aesop does a great job in the beauty care industry by proposing under-stated products that fulfill their role in a perfect way. They are simple, practical, super qualitative. Nevertheless, Aesop respects one golden rule when it comes to taking care of yourself: the pleasure that this should procures. So each Aesop product is always a multi-sensorial experience. Do not hesitate to visit the brand website for more information, where to buy it and to get more from the essential spirit of the brand: http://www.aesop.com . Info sourced at the Brand website and official brand communication release. Products were courtesy by Aesop. All content is copyrighted with no reproduction rights available.